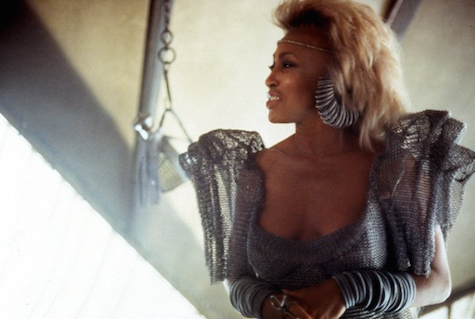 My introduction to the franchise came in 1985 with Mad Max: Beyond Thunderdome. 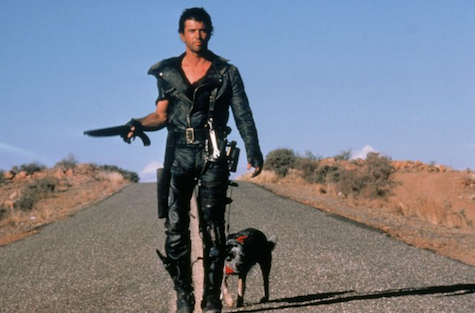 I’d loved it so much I’d quickly worked my way backward through writer/director George Miller’s Mad Max lore. I was drawn to it because I’d grown up in a church fixated on the apocalypse. At my childhood church, you learned Bible verses not because they meant something to you but because when the apocalypse happened and all the Bibles were destroyed, the world would need someone to rewrite it. You were baptized not because you loved Jesus but because you wanted to escape the fate of having your head chopped off in the end times. And even then there was no guarantee. Humans are naturally sinful creatures, my Sunday school teacher would say. The rapture might skip over you if too much time had elapsed between your last prayer and the rounding up of cleaner souls than yours. When I was ten, I had a postcard taped to the wall beside my bed — a picture of open graves and slivers of ghosts ascending from them into a glorious thunderstorm. I suppose it served as a reminder to be worthy. All the time. Just in case. But then there was also the appeal of the morbid ghoulishness of all those dirt holes at the feet of the tombstones. Fear and fascination coalesced. But let me back up just a little. 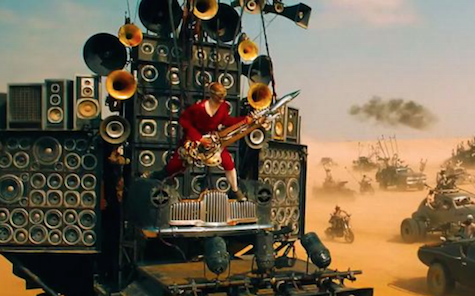 Mad Max spends a great deal of the film’s opening act as a human “blood bag” for ailing war boy Nux. When Nux wants to join the war party, he drags Max along so he can keep his transfusion going. A crude fishhook-like apparatus serves to anchor the IV tube to Nux, then to Max, the whole thing reinforced by iron cuffs on either man and a chain wound around the tube in between them. Every time Nux yanks Max along or that chain goes taut, I squirm. Then it hits me. While Miller in the older films of the Mad Max canon had managed to hold a mirror up to my intense childhood fears of the end times, with Fury Road he’s holding a mirror up to my anxieties of chemo drips, surgeries, and disfigurement. When Max is first processed in as a prisoner, Immortan Joe’s henchman determine Max to be a “universal donor,” a fact they tattoo across his back just before they prepare a branding iron to further mark him as Immortan Joe’s property. And there are other signifiers inscribed on the bodies of characters in Fury Road. Miller presents viewers with an array of damaged and diseased as the by-product of an unforgiving post-apocalyptic landscape. As Max himself explains, “Each of us in our own way was broken.” Me too! I was thinking. Me too. Films and novels have a long history of using disability, deformity, or disease to denote villainy. Think of Richard III’s bum arm, Captain Hook’s prosthetic hand, Voldemort’s reptilian nostrils, Freddy Kruger’s burn scars, Darth Vader sustained by his iconic cyborg suit, and every comic book nemesis born anew from a vat of toxic waste. It’s not so different in the Maxverse either. It is different, I suppose, that in Miller’s hands neither good or bad are immune from marked difference, but in Fury Road the closer one is to villainy the more his damage and disease is framed as grotesque. At the epicenter: Immortan Joe. We meet Immortan Joe (Hugh Keays-Byrne) as his attendants prepare to dress him. The camera studies the raw-meat striations of his scarred back, chest, and arms. The armor he’s fitted with is clear so we don’t forget what a mangled man this is. Like Darth Vader himself, he’s aided by a breathing apparatus, though Immortan Joe’s mask is embellished with his signature skull, the pump rising and falling on the backs of his shoulders with amphibian-like ballooning out of its folds in intervals. In short order, we learn this is a brutal man who’s co-opted other bodies as his most valuable resource. They’re laborers, warriors, little people perched as lookouts, blood bags hanging upside down on a slow drip, milk dispensers attached to steampunk breast pumps, breeders. And those breeders are integral to the main plot. Immortan Joe has forcefully assembled a harem for himself, and more than once we’re told they are pristine. 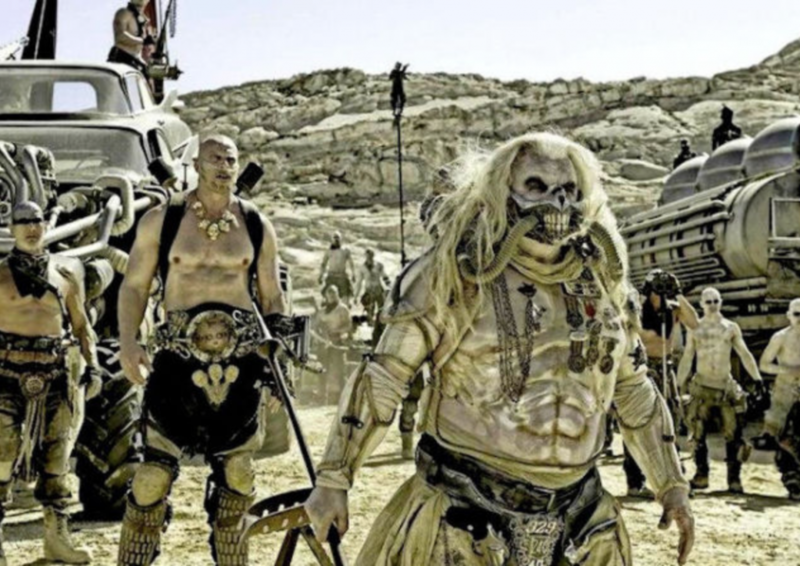 At one point, Max’s bullet grazes the leg of Splendid (Rosie Huntington-Whiteley), and more than one character notes how, in doing so, he’s hastened his doom by marring Immortan Joe’s favorite. Did I mention the wives are played, for the most part, by supermodels? And in this world, they serve as idealized figures, as well. No grotesquery here. Not even any dirt. Immortan Joe needs them and their perfection to not only keep his line going with a smattering of new offspring, but to enhance his lineage. When one of these babies is presented after a crude cesarean with something like a box cutter, the “surgeon” whipping the umbilical cord like a bored kid fidgeting with a licorice rope declares that “he is perfect in every way.” It’s a merciless world in which the sick, the imperfect, can’t really survive without a fight, though the more powerful among them can try to rig the game. Move a little further from Immortan Joe’s inner circle and you’ll find less grotesquery. You’ll find Nux (Nicholas Hoult). Nux is a figure who isn’t inherently bad, after all, but conditioned to be so in the cult of Immortan Joe. He’s a thing, serving a purpose in the machinery of Immortan Joe’s empire, just as the enslaved wives are regarded as things. Nux has decorated the two protruding tumors along his neck with whimsical faces at one point in the film and gives them names. Nux’s aberrations threaten only himself, not the larger society. And what he most wants, besides a glorious death on fury road, is to be seen, to be singled out from the throng of other bald, paint-smeared war boys. 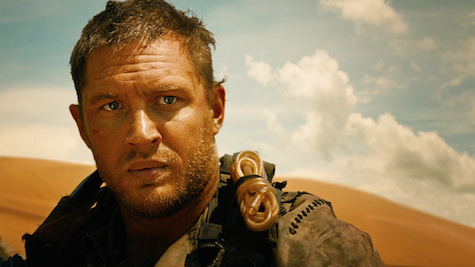 At one point in the chase after Furiosa and the brides, he’s convinced that Immortan Joe has, indeed, noticed him. “He looked at me!” he exclaims. “He looked right at me!” While Immortan Joe in his see-through armor wants his damaged appearance to be viewed, to be regarded as frightening, intimidating, Nux wants to be seen not through the filter of his disease, but as an exemplary warrior. Nux is the middle ground, the link between the villainous and the good, the grotesque-damaged and the exquisite-damaged. Enter Furiosa. Like the supermodel brides, Furiosa is beautiful. I mean, she’s played by Charlize Theron, the woman who fluidly struts through Dior commercials like a sorceress parting waves with a flick of her hand, the woman who required hours of painstaking special effects make-up in order to look like an ordinary human in Monster. 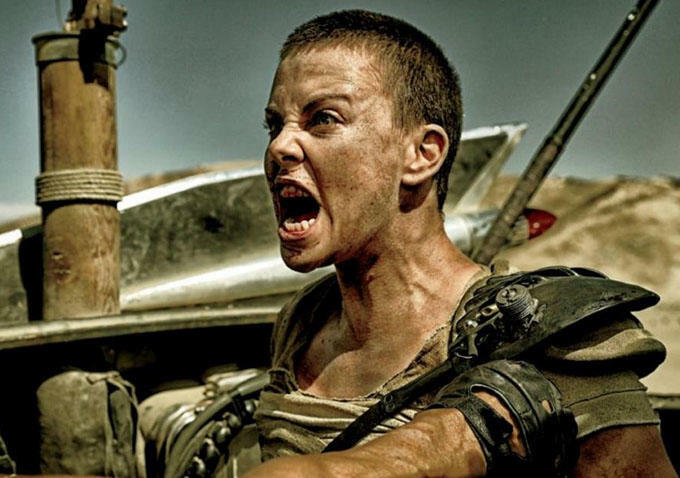 As Furiosa, her hair is shorn, the upper half of her face is blackened with truck grease, and her amputated arm is fitted with a mechanical prosthetic. She’s damaged too, but because she’s our hero figure, her damage isn’t highlighted. Only once does her prosthesis attract the lingering inspection of the camera, when it falls off in a skirmish and she reclaims it from the sand and reattaches it with the same ease with which she shimmies the stick shift of her tanker into the next gear. This is how I’d prefer “disability” be viewed in film, as natural as if she’d had the full length of her actual arm. And Furiosa is how I prefer female characters be regarded in film: as key figures with agency, with a strength and competence that isn’t viewed as an anomaly by the directorial eye or the other characters. There’s a particular scene in which Max’s bullets have nearly been depleted and he twice misses a vital shot at an approaching goon. Furiosa takes the gun, steadies the barrel on Max’s shoulder, and finishes the job. He’s not surprised. He’s not emasculated or threatened or diminished. He’s only wiggling a finger in his ear to silence the ringing of the shot. I don’t think it’s spoiling anything to tell you something happens to Immortan Joe in the end. I mean, he is a villain. You can expect something to happen to the villain. I just won’t tell you what that something is or how it transpires or how permanent it is. I will tell you I had a visceral reaction to witnessing it, as if every cell in my body was celebrating. If Miller’s work had managed to so aptly reflect my anxieties, the fate of Immortan Joe in itself reflected my desire to obliterate that anxiety. Great post, Cynthia! I’ve been waiting to hear how folks who live and/or research disabilities would read this awesome film. Godspeed on all your chemo treatments–I’ll be keeping you in my prayers! Thanks so much, K. B. Much appreciated! What a perfectly crafted essay/review! May God give you victory over this cancer, and you and your family strength in the interim. This is a voice too soon silenced. It’s only been a day and I miss her so much.